“Great success comes when you take a different path – the path that has not been laid out yet,” President David A. Costello told the 101st NASBA Annual Meeting, held October 26?29 in Boston. The meeting drew representatives from 52 state accountancy boards, including 132 delegates, 34 associates, 50 administrative staff and legal counsel, with other interested parties totaling 342 in attendance at the meeting, and including guests 445. President Costello pointed to NASBA’s mission, its work on the Uniform Accountancy Act and the development of the computer?based Uniform CPA Examination as examples of paths NASBA has taken that were not commonly tread. “NASBA has been about going down different roads,” President Costello observed. “We will always choose those less traveled paths. When you see the invisible—then you do the mpossible. 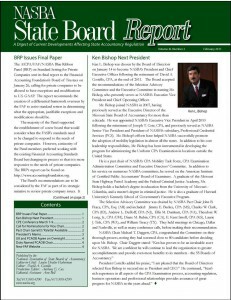 We, like JFK, are going to the moon – a different kind of moon.” This issue the State Bpard Report cover several of the presentations made at the Annual Meeting and the Forum for International Accounting Regulators. Many PowerPoints and talks from those events can be found on www.nasba.org in the “Meetings” section.